And the winners are in?.The 2018 "Citizen of the Year," "Business of the Year" "Educator of the Year," and "Outstanding Lifetime Achievement" award winners have been named. 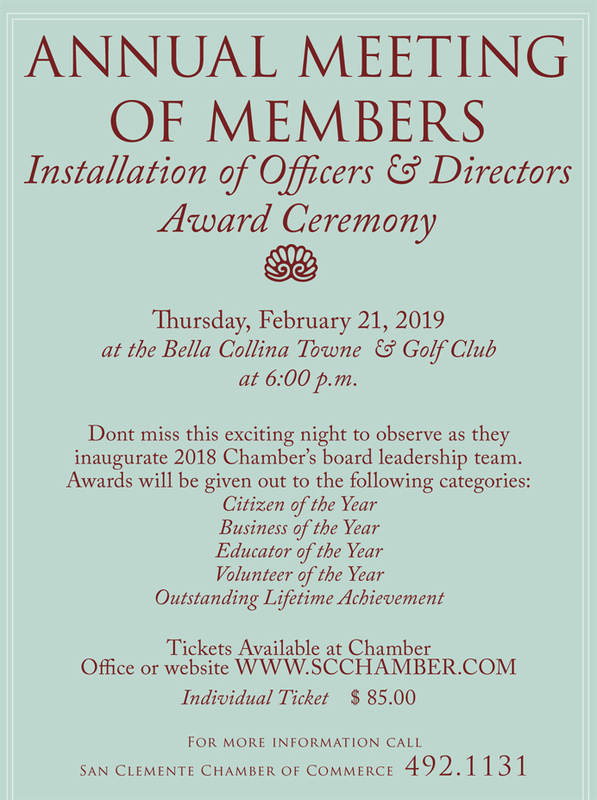 These prestigious awards will be given out to their deserving recipient at the Chamber's "Annual Meeting of Members, Installation of Officers & Directors and Award Ceremony," on Thursday, February 21, 2019 at the Bella Collina San Clemente at 6:00 p.m., in beautiful San Clemente. Former Mayor Tim Brown will be the Award Officiate at this prestigious event. Do not miss this exciting night to see your local constituents, visit with friends, observe as the Chamber's Board members are installed and the award winners receive recognition. For more information, contact the Chamber office at 492-1131. Seating is limited you must RSVP for this event.